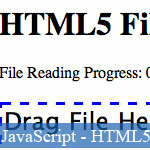 HTML5 finally provides a standard way to interact with local files, via the File API specification. As example of its capabilities, the File API could be used to create a thumbnail preview of images as they're being sent to the server, or allow an app to save a file reference while the user is offline. Additionally, you could use client-side logic to verify an upload's mimetype matches its file extension or restrict the size of an upload. File - an individual file; provides readonly information such as name, file size, mimetype, and a reference to the file handle. FileList - an array-like sequence of File objects. (Think <input type="file" multiple> or dragging a directory of files from the desktop). Blob - Allows for slicing a file into byte ranges. Note: At the time of writing this tutorial, the necessary APIs for working with local files are supported in Chrome 6.0 and Firefox 3.6. As of Firefox 3.6.3, the File.slice() method is not supported. Of course, if you're app will only use a few of these APIs, modify this snippet accordingly. Example: Using form input for selecting. Try it! Another technique for loading files is native drag and drop from the desktop to the browser. We can modify the previous example slightly to include drag and drop support. Example: Using drag and drop for selecting. Try it! Note: Some browsers treat <input type="file"> elements as native drop targets. Try dragging files onto the input field in the previous example.